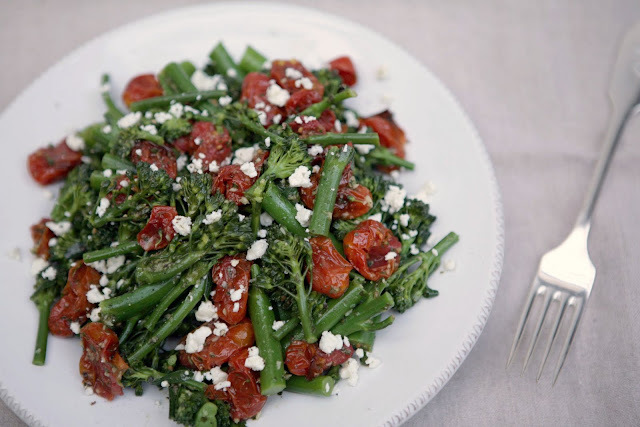 Now that you've got some roasted baby tomatoes and mint gremolata on hand, I suggest you toss them with warm broccolini, crumble some feta on top and dig in. It's an ideal dish for practicing the USDA's new food icon, MyPlate, which I love because it makes me think our country is getting serious about mindful, responsible eating. And in case the USDA doesn't convince you to eat more vegetables, head over to the New York Times and read Mark Bittman's argument for a plant-based diet augmented with limited quantities of wild fish and sustainably, ethically and locally produced meat, dairy and eggs. This dish reminds me of the vegetarian antipasto (green beans and broccoli marinated in olive oil and lemon) at Tommaso's in San Francisco's North Beach. A favorite dinner spot during frequent family visits to the Bay Area, Tommaso's wood-fired pizza oven is renowned but I think their vegetables deserve equal acclaim. 1. Steam the broccolini until crisp-tender (about 5 minutes). Transfer to a collander and rinse briefly under cold water to halt the cooking process and preserve the bright green color. Roughly chop the warm broccolini, place it in a large bowl, and add the gremolata and roasted tomatoes. Toss to combine. Serve with a sprinkling of feta, salt and pepper. Or cover and marinate in the refrigerator for up to 24 hours before serving. gorgeous colors - like the italian flag!